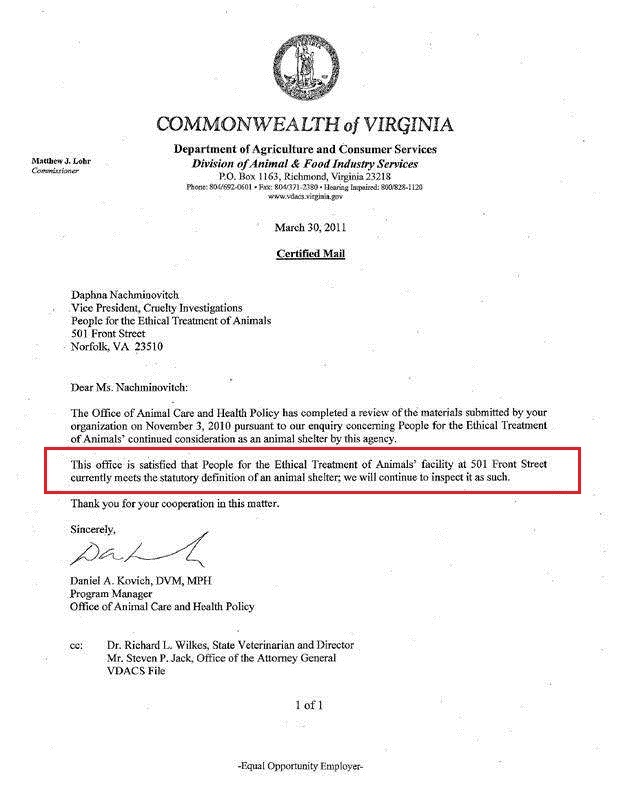 When I contacted Virginia's State Veterinarian, Dr. Dan Kovich, DVM, MPH, February 7th, 2012, regarding PETA's animal releasing agency licensure, whether they're licensed as a "shelter" or a "humane society," and about the state's inspection protocol, he explained that there is no requirement of non-municipal animal releasing agency licensure in Virginia, so PETA is neither licensed as a shelter nor a humane society. I inquired about PETA's "organization type" listing of "humane society" on the VDACS (Virginia Department of Agriculture and Community Services) animal reporting summary form, and asked him to confirm whether the state considered PETA to be a "humane society" or a "shelter." Dr. Kovich responded "We consider them to be both." He went on to explain that the state considers "shelters" to be physical structures, so any releasing agency that has a building that houses animals prior to their disposition, is inspected as a "shelter," meaning, when the state inspects PeTA's "shelter," it's inspecting its animal housing. The Matter of PETA's "Licensure"
When I asked him to further explain the difference between "shelter" and "humane society," Dr. Kovich stated that the term "shelter" describes a physical structure, and the term "humane society" describes the organization's purpose. None of the organizations listed on the VDACS animal reporting record summaries are listed as "shelters" for that reason. An organization may be listed as a "rescue," "humane society," or a "city" or "county" agency, but organizations are not considered to be "shelters" by the state, even if the organization relates to the public that they are a "shelter" in its title. When I asked him if the term "shelter" is also used to describe organizations, he replied "Not as far as the state is concerned. Organizations can call themselves 'shelters,' but the state doesn't define organizations that way." Dr. Kovich went on to explain that while the public may consider the term "shelter" to be synonymous with "adoption facility," the state does not require animal releasing agencies to operate with the primary purpose of finding companion animals permanent adoptive homes, reminding me that the state considers each of the three methods of disposition--transfer, adoption, and euthanasia--to be equal under the law. In Virginia, an animal releasing agency may operate for the primary purpose providing humane euthanasia to suffering community animals, but as long as they operate a facility that finds permanent adoptive homes for animals, on some scale, that facility will be considered an "animal shelter" and the state will inspect it as such. I asked Dr. Kovich about about the 2010 "Site Visit Report" published on the Center for Consumer Freedom's website. He confirmed that the report is indeed authentic and he stated that he felt that the site visit was warranted at the time to determine if PETA's animal housing should continue to be inspected by the state as a shelter, though he reiterated that according to the state, each of the approved methods of disposition are equal under the law. The Center for Consumers Freedom's allegation that "The state inspector attempted to revoke PETA's license to operate a shelter," is unfounded. Dr. Kovich explained that the state of Virginia doesn't license non-municipal animal releasing agencies. 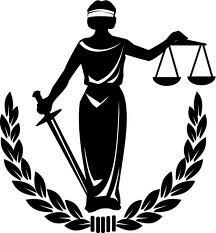 There is no license to revoke. There's also an interesting story behind the famous 2010 site visit. Learn more here. When I asked Dr. Kovich if he has reason to believe that PETA misrepresents their purpose to the public or to persons who bring their animals to them, he replied "To the best of my recollection, the State Veterinarian's office has never received a complaint from anyone who felt that PETA had misrepresented their services in any way." When I asked Dr. Kovich if I could quote him on that, he replied "Sure." The Center for Consumer Freedom's and Nathan Winograd's claim that PETA euthanizes adoptable animals in their Norfolk Virginia facility, is probably their most insidious allegation. Because of it, many people operate under the misapprehension that the Virginia Department of Agriculture and Community Services (VDACS) requires animal reporting agencies to log information regarding the "adoptability" of the animals they receive, but that's just not the case. What Does "Adoptable" Mean, and Who Makes the Determination? 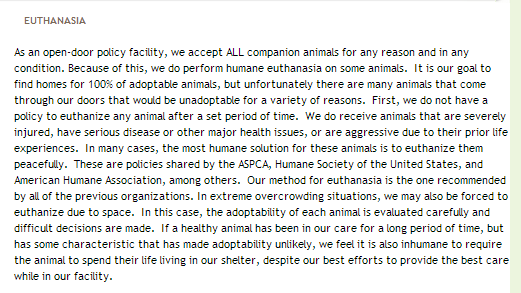 This is the euthanasia policy of a Nathan Winograd-celebrated open-admission "Documented No-Kill" shelter in Kentucky. I publish it here because I believe it best describes the sliding-scale nature of "adoptability," in the current crisis of companion animal overpopulation. Being labeled "adoptable" is no guarantee that a safe, caring home awaits an animal. Shelters that want to limit euthanasia generally limit their admissions to animals they feel have the best chance for adoption, but all shelters make determinations about "adoptability." Shelters that have "open-admission" policies take all animals and make determinations about their adoptability after they've been admitted. Shelters with "limited-admission" policies make determinations about adoptability before admission, and less-adoptable animals are turned away to other fates. "Perfect" and "Healthy" Doesn't Always Mean "Adoptable"
"Normally, when animals leave Animal Ark, it is cause for celebration. But, today, we had to say goodbye to our beloved Karma, and the atmosphere at the shelter was pretty gloomy. Karma was put down this morning. "While we rarely euthanize any animal, it is even more rare that we put down an animal that is physically in the prime of their life and healthy by all accounts. It virtually almost never happens. Of course, there is the other half of the health picture and that is mental health. "Karma has suffered from a challenging set of anxiety, frustration and stress issues that initially resulted in her having restrictions on who could handle or visit with her. This is because when frustrated, Karma would use her teeth to express that frustration. These events were usually of short duration and not particularly eventful. "Unfortunately, that changed on Friday. I feel fortunate that I was the target of her frustrations that day. I am equally happy that i was not more seriously injured. "Some small dogs that exhibit true aggressive behavior can be managed. Other dogs with aggressive behavior that have known triggers (that can be avoided or desensitized) can also be managed. But a very large aggressive dog who will attack for no specific, discernible reason is simply beyond our ability to place into a home, sanctuary or to manage. 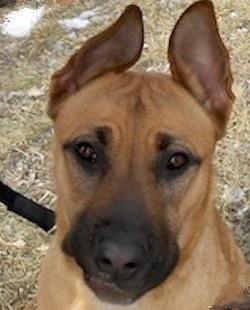 Karma was euthanized this morning and her body sent to the University Diagnostic Lab for rabies testing. "In spite of the challenges in housing and caring for Karma, Animal Ark still loved her. She was a physically spectacular dog, with an intensely high-energy drive that was absolutely remarkable to behold. She was also incredibly smart. In the Ark Park, she could run like no dog I have ever seen.